Tag Archive | "england team"
I think an England manager must make up his mind what players he has and then find a rigid method for them to play to. If any player, no matter how clever an individual is not prepared to accept the discipline of the team’s method then I can see no advantage in selecting him. The football conundrum is that it is a team game with all the room in the world for individual expression. The weight has to go somewhere. In England, with a traditional dribbling game, it went to the individual. In Scotland, with a traditional passing game, the team was more the thing. Ramsey hated Scots. But he thought like a Scot about England. To get him, the FA had to change the habits of ninety years. No more selection committees. Ramsey was to be in total charge of tactics and team selection. That was more than a change in manning and demarcation. It completely altered the cultural place of the England team in the national game. The selection committee, with Walter Winterbottom’s involvement, would try to put together a winning side, true. But an England shirt was also seen as a reward for service. And there was a pork barrel element to it too: committee members would favour players from their own clubs. All this would now stop, and something else take their place. But Ramsey’s desire to pick the team himself didn’t make the complete sense in 1962 that it makes now. There was still very little football on television, and what there was was insufficient for tactical analysis or judgment of players or the spotting of new talent. The England manager would need a thousand scouting eyes. He’d need to attend matches as often as he could. In 1962, with the maximum wage only just abolished, football club squads were far larger than they are today – probably at least twice the current size. They would be predominantly English. Furthermore, the retain-and-transfer system, which still had a year to live, meant that a lot of top talent was trapped in the lower divisions. Picking the best squad from such a throng, let alone the best side, was a formidable task. By 1962, too, the war babies were coming into England contention. They were the best fed generation before or since, and their crucial street football years had been clear of cars. Hungary aside, the South Americans, who’d sat out 1939-45, dominated post-War football. By 1966, England would have a new group ready to take them on. And what a group it was: between 1966 and 1972, the First Division had enough talent to carry seven different title winners, all of them memorable sides. What’s more, this group were in receipt of better training and tactics that any previous English players. Ramsey himself had played in both the 1-0 defeat to the USA in 1950 and in the 6-3 Hungarian disaster. He wasn’t the only man in English football to spend the ’50s suffering from and obsessing over these experiences. Joe Mercer and Walter Winterbottom went into the schools to institute Jimmy Hogan-style skills training; Stanley Matthews pioneered modern playing kit; Don Revie brought Hungarian ideas to Manchester City. 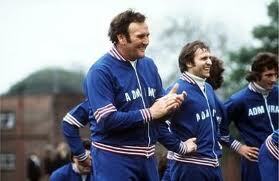 And the clever Scots, Busby and Shankly, had arrived. By the end of the 1960s, the culture would have changed, and working class male talent went, successfully but with no track record, into music. But before the decade was out, England would send a team to the top of the world and bring it safely back again. Four times. Once before Ramsey, in 1961, Winterbottom’s last great side with the young Jimmy Greaves. In 1964, the year of Johnny Byrne. In ’66. And – it’s right by my calendar – 1970. It was done despite a querulous press corps (“What’s it about, Alfie?”) and some spectacular condescension from television and middle class media. It ends, as we’ve seen, in endless remembrance, celebration and a lifetime of receiving lifetime awards. 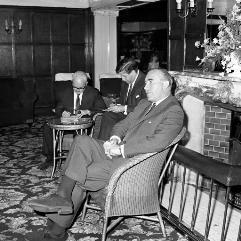 Ramsey took over in May 1963. 1961 had been great, but better was to come. England’s best teams have almost always peaked outside World Cup years – the 46-48 side, the 60-61 team, and the 75-78 side that Revie never picked are just 3 examples. Although the press and the fans prioritise World Cup success, the FA haven’t on the whole, preferring to see the England team as an enjoyable adjunct to the real business of maintaining the best grass-roots game in the world. Choosing the England manager has been a case of finding someone who will take care of far more than just the international side – one reason among others for the appointment of Bobby Robson and Ron Greenwood; similarly, the non-appointment of Brian Clough. For the first half of the twentieth century – the half that gave Italy two of their three World Cups, and Uruguay one half of theirs – England were quite correct to focus on the Home Championship as their source of international competition. Between 1900 and 1920, other international matches – such as the Olympic tournaments – were far too one-sided. England, with a fully-fledged league system behind them, got into double figures frequently, and ended up sending an amateur team to the Olympics just to make things more competitive. Between 1920 and 1950, things were a little closer – but when Italy brought their “World Champions” to England, they resorted to thuggish tactics simply to keep England in sight. After the war, England became far more involved in international football, but before 1950 the story was much the same – easy victory. It’s forgotten that England’s defeats abroad – to Spain, for example – were defeats for what was almost certainly a badly hung-over team who were treating the trip as a holiday yet playing hyped-up super-motivated opposition for whom the game was the highlight of their lives. What’s seen as England’s fallow period since 1970 was in fact very short – lasting perhaps from 1972 and the Netzer game at Wembley, to 1977 and the defeats to Italy. It’s a period coinciding with Ramsey’s decline and Revie’s failure to pick a team from perhaps the best generation of skilful, inspiring footballers England’s had since the War. The anxieties and lack of confidence that were born in that period are still with us today, and are reflected in the bizarre, Cassandra-esque reporting of international matches. I believe that England teams have, until Eriksson, played at 5-10% below their real ability as a consequence of this. By contrast, our success in European club football in the 1970s raised confidence and expectations to such a degree that a mediocre side such as the Aston Villa of 81-2, or the talent-limited Forest teams of 78-9, could expect to win European cups and do so, repeatedly. It sounds strange to say it, but behind all of this is an unexpected truth: we have cared less than other countries about winning the World Cup. Mexico have gone home already, but their team had six months together to prepare; we negotiated an extra week. During tournaments, there’s a lot of huffing and puffing in the media, but the fact is that we can put up with not winning – and that’s why we don’t. Four years ago, Clive Woodward decided that nothing was going to stand in the way of England’s rugby men winning the ultimate title, and that was the beginning of a quite extraordinary and utterly focussed effort that just – by the skin of the teeth – succeeded. Such was the mental energy expended that the side have since gone into colossal decline, and have no chance of defending their title next year. Likewise, the England cricket team won the Ashes through what appears now as a moment of decision – that it mattered at the ultimate level to win, and it mattered now. Since then… it’s all gone away. In both rugby and cricket teams, the vital players have been missing through injury almost ever since. If England win – and they seem to have a similar outlook to the rugby and cricket teams – you can almost guarantee four years of total mediocrity afterwards. You can probably guarantee it anyway – Erickson’s successor has been chosen, not to win trophies, but to facilitate the development of a new generation of English coaches. It needs doing, but it’s not a goal shared by the press or the fans.